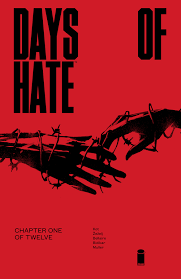 With any book like Days of Hate, there is something to be said for what the creators are trying to tell us. The premise of the story is that America broke out in Civil War. We are dropped into world that could be prophetic for the American nation. The book opens with two people investigating a hate crime where a bar was torched by Nazis (assumed based on the evidence). The characters choose to make what could be the right choice for revenge/justice. While the story takes place 2022, it is a fantasy that should hit home to any reader willing to give it a chance. Twelve issues are a bit much for anyone to experience the hate that can or will exist in this story. It could be a potential learning experience for the reader. The artwork is dark and gritty. It has a strong emotion with the strong lines and heavy inking style. The coloring helps the tone of each panel and page. I didn’t know what to expect with this book but so far I’m on board and ready for more.